The Vermont Department of Libraries kicked off the Vermont Early Literacy Initiative- Science, Technology, Engineering, and Math (VELI-STEM) program at a recent press conference at the Vermont State House. 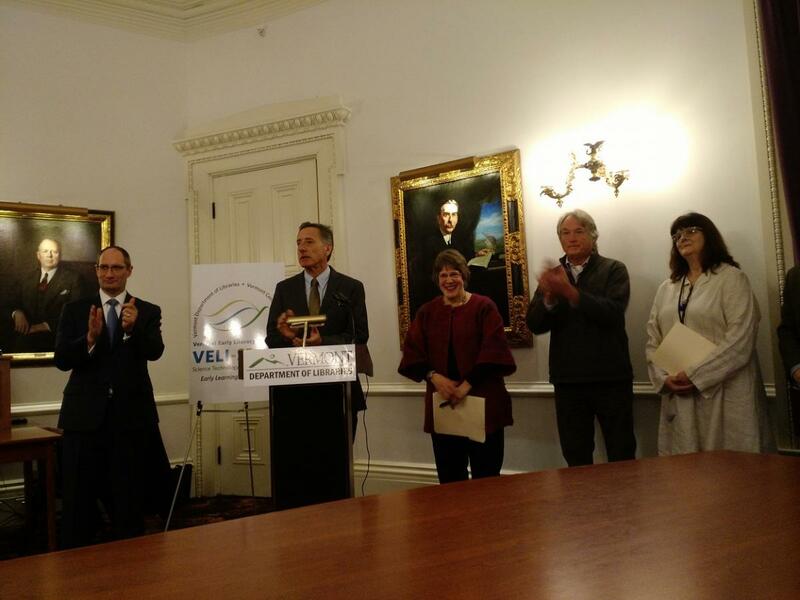 The press conference, headed by Governor Peter Shumlin and State Librarian Martha Reid, included the display of the new VELI-STEM logo. Funded through a $339,861 Institute of Museum and Library Services (IMLS) National Leadership for Libraries grant, VELI-STEM is a three-year project in 25 small and rural Vermont public libraries. With an emphasis on physical science and science inquiry, the project will provide training, books, hands-on materials, and other resources to library staff, young children and their families, and local childcare providers.The project is designed as a national model for STEM programming in small and rural libraries, and will include training of personnel from 22 other state library agencies who will visit Vermont. Our grant partners for this initiative are the Vermont Center for the Book and the Montshire Museum of Science. In his remarks, Governor Shumlin noted that Vermont public libraries are busier than ever, logging over three million visits in the past year. He also underscored the important connection between STEM learning for young children and the jobs of the future, stressing the need for strong and innovative programs for early child literacy in Vermont. Pictured: Vermont Secretary of Administration Justin Johnson, Vermont Governor Peter Shumlin, State Librarian Martha Reid, Board of Libraries member Jim Gish, and Vermont Center for the Book Associate Director Wendy Martin applaude librarians for what they will deliver in STEM programming. Other speakers at the press conference included Education Director of the Montshire Museum of Science Greg DeFrancis, Associate Director of the Vermont Center for the Book Wendy Martin, and representatives from the offices of Senator Patrick Leahy, Senator Bernie Sanders, and Congressman Peter Welch. Greg DeFrancis spoke about the importance of early STEM education and building curiosity and exploration in young children through out-of-school learning experiences. He noted that 95 percent of STEM learning occurs in informal learning settings, making libraries and museums natural early learning environments. Wendy Martin talked about the professional development aspect of the project in which participating librarians will learn by doing—just as preschool children and their families will—with active, hands-on, standards-based STEM explorations. 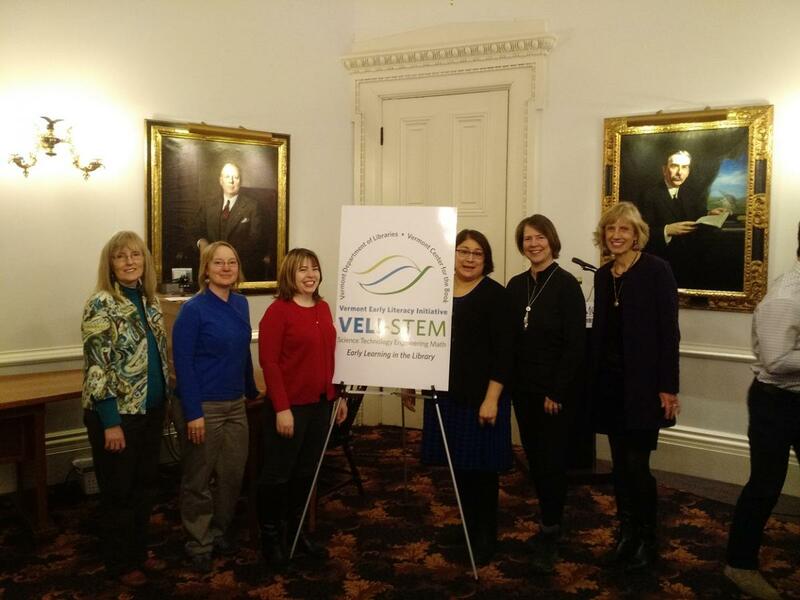 Pictured: Vermont librarians applauded the VELI-STEM launch. This project will build on the Vermont Early Literacy Initiative (VELI), a program jointly launched in 2010 by the Vermont Department of Libraries and the Vermont Center for the Book. The VELI program is now going strong in 75 public libraries across Vermont. Past trainings have focused on preschool literacy and pre-reading skills, preschool mathematics, and social-emotional development. VELI library programs have reached over 2,200 families, impacting more than 4,000 children. In addition, Vermont librarians have trained 880 child care providers who have received books and materials to use with over 5,000 children in their care. For more information about the VELI-STEM project, contact Sharon Colvin, youth services consultant for the Department of Libraries at sharon.colvin@vermont.gov . Wendy Martin is associate director of The Vermont Center for the Book.